Please Contact Us if you have any questions about the personal training forms and charts. Want to learn more about each item? Continue reading this article for all the details. Ready to download? Click the ‘Download Now’ button below to place your order. Order Notes: You will receive your digital order via email immediately after purchase. Please be sure to check your junk/spam folders. Are you newly certified or currently working as an independent personal trainer? Customizable Personal Training Forms and Charts can Make Your Life Easier! Personal trainer forms allow you to get all the necessary information from your prospective clients to help create a comprehensive fitness program. Personal trainer charts can help you communicate key concepts like body fat percentage, which are often difficult to explain to prospective clients. Print out the high quality charts with the AskTheTrainer.com branding for free or order blank customizable forms and printable PDF charts on this page so you can customize them and incorporate your own business logo for that professional touch. Get set up as an independent personal trainer with customizable forms and visually pleasing charts to immediately establish your professional presence and make communicating with clients far easier. For a limited time only and for the best value (savings of $19.99), purchase the complete personal trainer forms and charts package below. You can if preferred also purchase individual forms and charts on this page. Package Includes: 4 printable body fat analysis charts including men and women’s visual charts, color and b&w RPE chart, 6-page editable consultation form, and editable professionally written cancellation policy. Order Notes: You will receive your digital order via email immediately after purchase. All chart files come in PDF and are free of AskTheTrainer branding so you can if desired add your own business logo using Adobe Photoshop or equivalent software before you print. All the forms are fully editable so you can easily modify as needed. Add your business logo or completely revise the forms to fit your unique needs. or click the ‘Download Now’ button below to place your order. Quality charts can help you communicate concepts which are often difficult to explain to prospective clients. With the following charts you can explain different concepts quantitatively (numerically) as well as qualitatively (visually). Print out, blow up if desired, and laminate the charts for high quality visuals for your clients and/or your fitness facilities. Trying to explain to someone new to health and fitness about body composition can be a big headache. Qualitative body composition analysis charts will allow your clients to visually see what a drop in body fat will look like without any complicated explanations. Showing a client what lowering their body fat percentage will look like will help them understand how insignificant scale weight really is and clearly visualize what they can achieve. 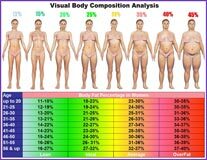 These qualitative body composition analysis charts are a 1 of a kind, valuable tool for personal trainers as they help explain a concept which is of utmost importance to your training services. Hire an anatomy artist and graphic designer and spend hundreds of dollars and hours of your own time to create these forms or order and receive them from AskTheTrainer.com via email within 24 hours. 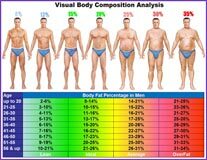 Get a high quality PDF version of the men & women’s visual body fat analysis chart without AskTheTrainer.com branding. Order both male and female charts together to save money. Order Notes: You will receive your digital order via email within 24 hours of your purchase. Chart PDF files are free of the AskTheTrainer branding so you can add your own company logo using Adobe Photoshop or equivalent software before you print. Assessing your clients body composition is pointless unless you can show them something about the numbers. 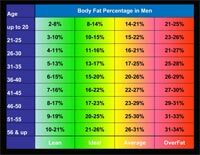 The chart differentiates body fat standards for 9 different age groups into four separate categories. 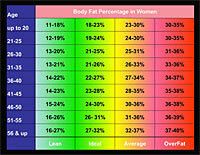 Get a high quality PDF version of the men & women’s body fat analysis chart without AskTheTrainer.com branding. Order both male and female charts together to save money. 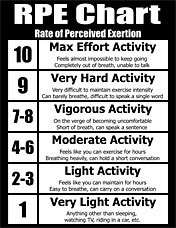 Rate of Perceived Exertion (RPE) is an easy way for you the personal trainer, to communicate exercise intensity to your clients. 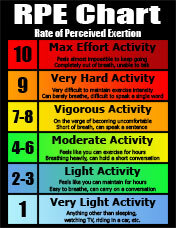 Having an RPE chart present also makes it easy for your clients to exercise with proper intensity. For dozens of years doctors have prescribed “vigorous activity” without explaining what it was. The brightly color-coordinated RPE chart will help the personal trainer and client. 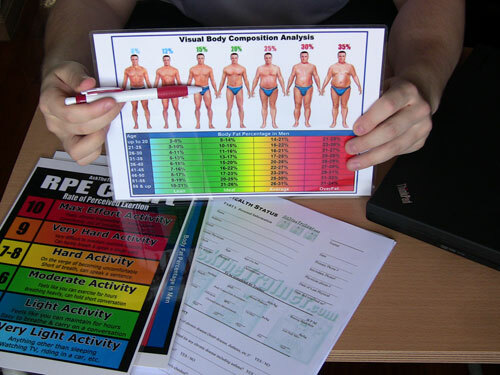 Order a full size printable color RPE chart without the AskTheTrainer.com branding. For a limited time only, all orders will receive a free black & white version of the RPE chart as well. As an independent personal trainer, your assessment/consultation forms and documents are an extension of yourself as they represent part of your professional image. Well designed personal trainer forms also allow you to get the information you need from your prospective clients to not only sell your personal training more, but also help your clients more effectively from the very first time you meet with them. One of the first things your prospective clients will notice is your consultation forms. Properly designed personal trainer consultation forms not only collect all the information you need to effectively diagnose and prescribe a fitness program to your clients, but also provide you with valid selling points to use to sell your services. Our customizable six page personal trainer consultation form is separated into health, fitness, and nutrition sections. Each section contains key bits of information about your prospective client including current behavior and psychological issues. Get a blank, professionally written customizable consultation form without AskTheTrainer.com branding. Brand with your own signature or logo and modify the form as needed to fit your business needs. Order Notes: You will receive your digital order via email immediately after purchase. Form comes in Microsoft Word .DOCX format so you can easily modify as needed. In order to run a business you must be firm and clear on your policies and procedures. Protect yourself from losing money and time with unreliable clients. Our professionally written (by lawyer) personal training policy signature sheet includes tardiness, cancellation, and expiration policies. Get a blank professionally written cancellation policy form without AskTheTrainer.com branding. Brand with your own signature or logo and modify the form as needed to fit your business needs. Order Notes: You will receive your digital order via email within 24 hours of your purchase. Form comes in Microsoft Word .DOCX format so you can easily modify as needed. Quantitatively assessing your client’s body composition and dimensions is a major part of being a personal trainer as it allows you to analyze your training program as your perform re-assessments around every 3-4 weeks. This simple form will allow you to track your clients circumference measurements of the arm, thigh, hip, waist, chest, and calf. Track your client’s 4-site skinfold assessment for determining body fat percentage using the Durnin & Wormersley formula. Calculate your client’s body fat percentage, lean mass and fat mass as well as overall body weight. Each page allows you to track 8 measurement dates which should cover at least 24 weeks of personal training. You can also download the excel spreadsheet if you enter data online as it will automatically convert body weight into lean mass and fat mass when body weight and body fat percentage is entered. Were you hoping to download the following charts?